I'm a big fan of food bars, which are a buffet of ingredients that allow folks to customize their food. 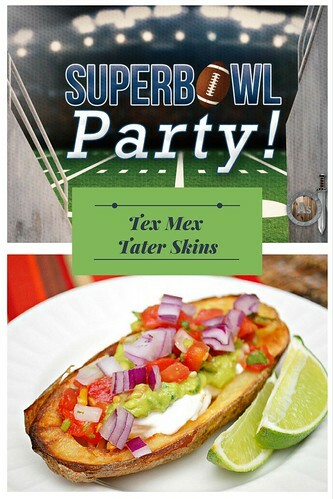 These potato skins are great to serve for a potato skin bar where everyone can top them with an assortment of toppings - sour cream, cheese, salsa, guacamole, etc. That said, you can make these in advance and warm them up just as folks arrive. Set them out in a big pile on the table and let your hungry guests have fun customizing them! Pierce potatoes with a fork; bake at 400° for 1 hour or until tender. Remove potatoes from oven and cut in half lengthwise. Scoop out flesh, leaving about a 1/4-inch-thick shell. Combine flesh, milk, sour cream, and buttermilk; mash with a potato masher to desired consistency. Stir in taco seasoning. Divide mixture evenly among shells. 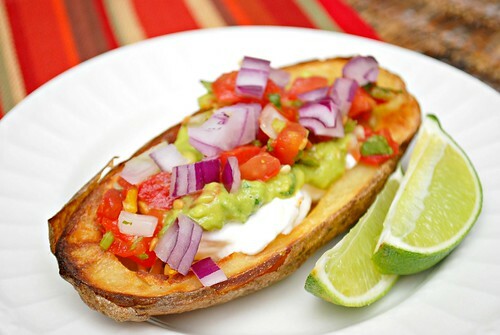 Place potatoes in a single layer on a baking sheet; sprinkle potatoes evenly with shredded cheese. Bake at 400° for 12 minutes or until heated. Remove from oven and top with your preferred garnishes.